The National Inquiry for Murdered and Missing Indigenous Women and Girls will be asking the federal government for more time and more money to complete its mandate. But how much more money and how much more time is unclear. It’s an “ongoing calculation,” Chief Commissioner Marion Buller said at a news conference Wednesday morning in which the commission released its one-year interim report. “When it comes time to approach the government… I want to be very specific and I want to be very accurate. In fairness to families and survivors I don’t want to have to go back to government a second time and say we need yet more time and money,” she said. Buller said that if an extension is not granted, the commission will continue to operate under the two-year timeline set out by the Trudeau government and fulfill its mandate. “We owe it to families and survivors, in fact, to all Canadians, to get to the bottom of these problems and provide workable solutions for all Canadians. We can’t stop,” she said. Commissioner Michele Audette said she was confident an extension would be granted. “I have a strong feeling that they’re following us, they’re listening, they’re reading what we’re posting and what we’re doing and they know we want to do a good job, something very important here, historical. So I have a feeling they’ll say, ‘Yes,’” she said. 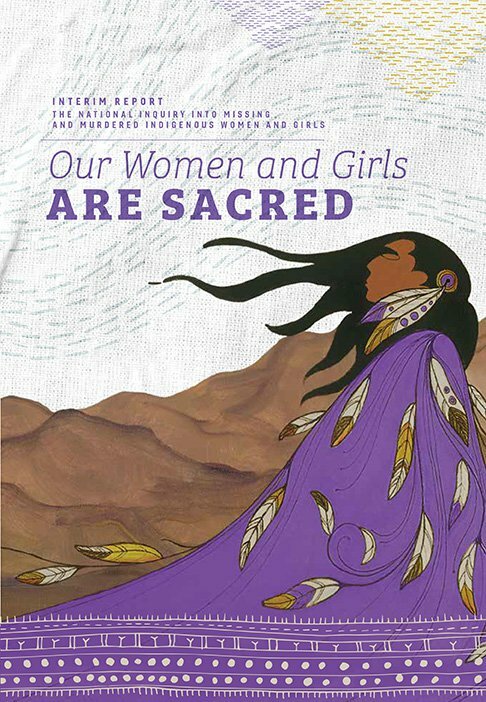 The 118-page report entitled, “Our Women and Girls are Sacred”, calls for the federal government to ante up more money immediately for health services for families and survivors; the creation of a national police task force; and the establishment of a commemoration fund. Commissioner Qajaq Robinson said although the commission’s terms of reference and mandate allow it to pass along information from families to police authorities for further investigation and prosecution, families hold little faith in the existing law enforcement institutions. “We believe that the appropriate authority to hear this evidence needs to be created immediately,” she said, and called on the federal government to work with the provinces and territories to create a national police task force, to which the national inquiry would refer cases. Robinson added that the creation of a national task force was a “proactive recommendation” from the national inquiry. While Audette said families and survivors would have input into the make-up of such a task force, the commission was “demanding” that Indigenous police officers be included. Buller said the national police task force would have to earn the trust and respect of Indigenous peoples. She said at this point no evidence has been passed on to law enforcement, but she anticipated that would happen shortly. Buller was clear that criticism about the administrative rules and procurement process that have hampered the progress of the national inquiry were directed at the policies and procedures and not the people. “I’m an eternal optimist that we can overcome the problems that we’re facing. We have started to overcome some of those difficulties, those problems, and I expect we will continue forward,” she said. The interim report outlined 10 recommendations, which also included implementation of all Calls to Action of the Truth and Reconciliation Commission, particularly those that impact Indigenous women and children; and, full compliance with the Canadian Human Rights Tribunal 2016 ruling which found that Canada was racially discriminating against First Nations children. The final report is to be completed by Nov. 1, 2018.